A panel of judges will narrow down the nominees to five and then will secretly visit each of the top five before a winner is named in October. Last year’s winner was Three C’s Diner in Corning. The bill also legalizes “fantasy” sports prizes connected to the performance of professional athletes. It’s currently illegal for an Iowan to claim winnings from FanDuel, Draft Kings or other online “fantasy” sports games. The sports wagering issue now moves to the House, where legislation similar to what passed the senate is eligible for debate. Last year, a U.S. Supreme Court ruling opened the door for states to join Nevada in the “sports book” business. Iowa is among 28 states that have moved to consider legalized sports betting this year. Six other states already took action to make the activity legal. The Atlantic City Council, Wednesday, passed a Resolution setting May 14th as the date for bids on a proposed addition to the Street Department Building, and May 15th as the date for a Public Hearing on the proposal, which has garnered much talk on social media and elsewhere. City Administrator John Lund originally said $100,000 was set aside for the proposed project. Councilman Chris Jimerson asked Snyder and Associates Engineer Dave Sturm where that figure came from, and if there were ways to reduce the costs. Jimerson said he looked at the Street Department facilities and asked what would be saved by remodeling the one stall employee restroom and knock-off 10-feet of the proposed addition dimensions. Sturm said the new bathroom would be ADA compliant, but wasn’t able to immediately furnish a cost breakdown. Right now, they have a bench to sit on in front of the building as a break area. Members of the AHS Speech and National Debate Team. 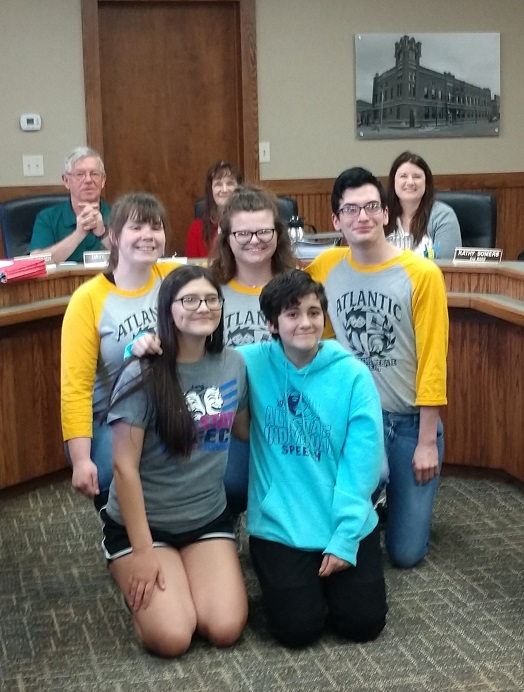 At the start of their meeting, the Council recognized the Atlantic High School All-State Speech Team and National Debate Team, including: Abigail Evans; Sarah Schorle; Belle Wickman; Grace McCurdy; Olivia Engler; Genevieve Martinez; Troy Roach; Molly McFadden; Regan Watson; Lane Muell; Carina Birkel; Nolan Perez; Brycen Ericksen, and Xander Moore. Atlantic Police report two arrests on Tuesday. Officers arrested 24-year-old Bryce Baker of Atlantic on a Cass County Warrant for Child Endangerment. He was taken into custody and transported to the Cass County Jail and booked in. Also arrested Tuesday was 27-year-old Haley Anderson of Atlantic on a Cass County Warrant for Child Endangerment. She was taken into custody and transported to the Cass County Jail and booked in. Gov. Kim Reynolds received word on Tuesday that two counties affected by recent severe weather and flooding along the Missouri River have been added to the Presidential Disaster Declaration granted March 23, 2019. Residents in Pottawattamie and Shelby counties are now eligible to apply for the federal Individual Assistance Program, which provides aid to eligible homeowners, renters, and businesses. The federal Individual Assistance program can provide homeowners, renters, and businesses grants and low-interest loans to help pay for temporary housing, home repairs, and other disaster-related expenses not covered by insurance or other aid programs. Individuals and business owners who sustained losses in the designated area can begin applying for federal Individual Assistance by registering online at www.DisasterAssistance.gov or by calling 1-800-621- 3362 or 1-800-462-7585 TTY. The toll-free telephone numbers will operate from 7 a.m. to 10 p.m. (local time), seven days a week, until further notice. Residents of Pottawattamie and Shelby counties who have already registered for the federal Individual Assistance Program should re-apply, as the Individual Assistance Program is now active and will accept their registration for the FEMA IA Program. The Iowa Individual Assistance Grant Program is no longer available to residents in Pottawattamie and Shelby counties following their addition to the Presidential Disaster Declaration. Citizens in these counties should now apply for the federal Individual Assistance Program. The Disaster Case Management Program is still available to impacted residents of Pottawattamie and Shelby counties through the local community action association, which can be found at www.iowacommunityaction.org. Shelby County Emergency Management will be hosting a Town Hall meeting at the C G Therkildsen Activity Center located at 706 Victoria Street in Harlan, IA 51537. 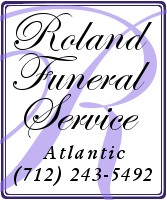 Meeting will be at 5PM on Monday April 22nd. Personnel from Emergency Management, FEMA, and the SBA will be on site to assist those in need with registration, and answer questions. For more information on flood recovery resources available to Iowans, visit www.floods2019.iowa.gov or contact 2-1-1. (Glenwood, Iowa – AP) Getting disaster aid approved and making sure it gets to the people affected by this spring’s flooding is a priority for area senators. The bureaucratic rules that govern disaster aid spending require an analysis of the costs and benefits of repair projects. Missouri Farm Bureau President Blake Hurst farms near the Missouri River, but his land wasn’t flooded. Hurst said the lessons from this flooding should lead to changes about where levees are built and how the river is managed. The Corps’ John Remus said the agency works to balance all the uses of the river and maximize the benefit to several when possible. But flood control is the main concern anytime flooding is imminent along the Missouri River. The Corps has also said that much of the water that caused the Midwest flooding in March came from rain and melting snow that flowed into the Missouri River downstream of all the dams it controls. At the same time massive amounts of water was filling the reservoirs and some had to be released. Farmer Leo Ettleman, who farms near Percival, said the Corps should have made significant changes to its operating manual after the historic 2011 floods, but neither the Corps nor Congress took action. Ettlemen said the kind of flooding the area saw this spring will continue unless changes are made. Ettleman joined a lawsuit against the Corps after the 2011 flood. Area politicians have said repeatedly since the flood that flood control should be the Corps’ top priority. Robert Criss, a professor at Washington University in St. Louis who has been studying flooding for more than two decades, said there may be a more important factor than how the Corps’ priorities are ranked. The Missouri River has been made narrower over the years, Criss said, and the Corps has worked to maintain a defined channel for barge traffic even though few barges ever cross the river near Iowa and Nebraska. “We’re having this problem because we messed with the rivers too much,” Criss said. A reminder: Democrat Presidential hopeful Senator Kirsten Gillibrand, from New York, will be at the Atlantic campus of Iowa Western Community College tomorrow ( Thursday, April 18th). Doors will open at 4:05 PM with Senator Gillibrand delivering remarks and conversing with caucus-goers from 4:20 PM until about 5:20 PM. Prior to the event, she will tour IWCC. “Conversations with Kirsten” will focus on the topics of education and national public service. Senator Gillbrand is the junior senator from New York. She was born and raised in upstate New York, where she, her husband, and their two sons still reside. Prior to being elected to the US Senate, she served as a law clerk and as a lawyer in the U.S. Department of Housing and Urban Development during the Clinton administration. She was elected to the House of Representatives in 2006 and was appointed to the U.S. Senate in 2009, where she has since won reelection twice. Her campaign would appreciate an RSVP from those who plan to attend the event. You can do so by going to https://www.mobilize.us/kirstengillibrand/event/90257/ Of course, you can attend without signing in but the numbers will determine in what room the event will take place. (Radio Iowa) — A spokesperson for the Iowa Department of Transportation says around 30 percent of Iowa’s licensed drivers now have a “Real I-D” license. Andrea Henry says the licenses that have been approved for the program have a gold star in one corner. “It’s a way for the federal government to verify the identity of folks who carry a state-issued I-D. 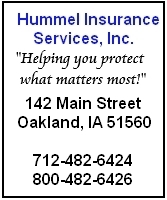 So, instead of having to having to have a federally-issued I-D, they can use their Iowa driver’s license, but their identity is verified through the federal government,” Henry says. Henry says the process of upgrading your driver’s license is pretty easy. “You have to show you are who you say your are by bringing in something like a birth certificate or your passport, or a permanent resident card. And then you have to document any name changes,” she explains. Henry says you need the documents that show you changed your name. “You need to have marriage certificate — or going the other way — a divorce decree or any court order for a name change if you legally changed your name,” Henry says. Henry says most people make the change when renewing their driver’s license. She says when you renew your driver’s license, there is no extra cost. After October 1st of 2020 if you are not up for renewal, it will cost you 10 dollars for a replacement card. You can go to the Iowa Department of Transportation website to find a complete list of documents you will need to get a Real I-D.
DUBUQUE, Iowa (AP) — A Chicago man who accidentally was shot when he tried to pick up a child has been imprisoned in Iowa. The Telegraph Herald reports that 19-year-old Romell Enoch had pleaded guilty to carrying weapons and being a felon in possession of a firearm. He was sentenced last week to five years in prison. Dubuque County District Court documents say Dubuque police were sent Aug. 25 to check a report of a gunshot. Officers found Enoch hiding in some bushes not far from where he’d been shot. He told officers that he had the handgun in his pants when he bent to pick up the child. It fired, wounding his right leg. He was treated at a Dubuque hospital.